When it comes to those you love, you want the very best for them. If you have a child with special needs or an ongoing health concern, giving them the best generally starts with ensuring they have the care they need. For many, this is where home healthcare steps in and helps out. At a home healthcare agency like Evergreen, our goal is to provide you and your loved one with the assistance, education, and advice you need to give your loved one the best living situation possible. We understand that finding a way to pay for home healthcare can be difficult. If you ever need assistance, Evergreen Home Healthcare has advocates and resources available to help you create a long term plan. Here are a few options that can help when it comes to covering the costs of both adult and pediatric home healthcare services. First and foremost, covering the costs for a home healthcare agency’s service should start with your insurance policy. More often than not, your child’s primary care provider will submit documents in support of home healthcare. The difference between full and partial insurance coverage can come down to everything from how long the care is needed to what your specific policy is written to provide coverage for and whether the in-home care is required versus suggested. If you’re unsure or would like assistance figuring out how to use your insurance coverage to pay for home healthcare, the team at Evergreen Home Healthcare can help you connect with resources to not only sort out insurance coverage, but also help you with long-term financial and care planning. Are You Qualified for Health First Colorado? Health First Colorado is our state’s version of Medicaid. Many who do not qualify for Health First Colorado on the basis of financial status may still qualify for the program if you or a family member meets certain other health-related criteria. An ongoing acute illness or long-term health issues, whether from injury, illness, or disability, may all qualify you or your family member for Health First Colorado. Coverage can then offer payment coverage or payment assistance for health care services, including in-home care from a home care agency. This way, your loved one can get the care they need from a certified nursing assistant. In addition, HFC coverage will often also cover visits from a physical therapist, speech pathologist, or other occupational therapist. This way, even mobility issues won’t get in the way of your child or loved one getting the healthcare attention they need. Of course, just because insurance and/or Health First Colorado coverage are helping cover the cost of a home health aide or therapist, that doesn’t mean that seeking care for your loved one is less of a strain. Every bit helps, especially with ongoing illness and disability care. Even if insurance is covering all or the vast majority of home healthcare services for your loved one, you may be able to claim those services as a deduction on your annual tax return. Your home healthcare agency may be able to connect you with a free or low-cost tax help location, so you can make the most of every tax filing and help ease the financial burden of ongoing care costs. Just as there are special provisions in federal and state health care policy laws to provide care coverage for those with disabilities and other ongoing health concerns, there are also tax breaks and deductions available at both the state and federal level to help you out. Getting help from a tax accountant who specializes in long term healthcare is one way to help you’re getting every break you can. 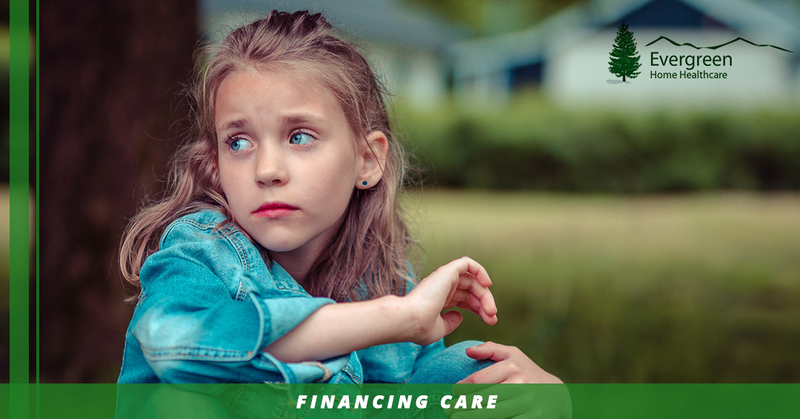 Whether you need home healthcare service for a child, an elderly loved one, or anyone in between, finding the means to pay for coverage can be a complex task. In order to reduce the weight of that burden as much as possible, it’s important to develop a plan as early as possible. We understand that figuring out where to start to develop that plan can be immensely difficult; the good news is, there are resources available because you aren’t the only one in this position. Contact your local home healthcare agency, Evergreen Home Healthcare, to get help today!